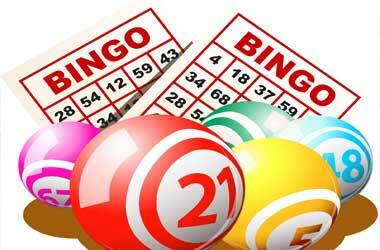 When you play bingo games such as 75 ball bingo online you will find that before the next game starts one of hundreds of different bingo patterns will be chosen at random and will be the pattern you need to form to win that next game played. As there are hundreds of different potential bingo patterns we have decided that we should enlighten you on some of the newest ones to have been launched at several different bingo sites. 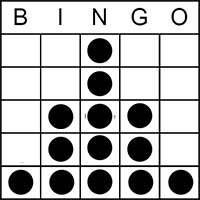 As such below is an overview and explanation of how each new bingo pattern works and has been designed. You do not necessarily have to remember each bingo pattern as when a new bingo game starts using a different bingo pattern at the top of your screen you will see the way the pattern has been formed and to make your life much easier the software and bingo platform you are using to play online bingo is going to keep full track of each of your purchased bingo tickets and will make off each one when a number is called out of the bingo machine and is also going to call bingo for you when if you form the winning patterns before any other player. What is a Four Corners Bingo Game Pattern? The Four Corners Bingo pattern is one of the easiest ones to remember for when playing any bingo game with this pattern as the winning one you simply need to have all of the corner numbers on just one of your bingo cards marked off first to be deemed to be the winning of that game. These games can take a little while to play off depending on just which numbers are drawn out as many of the numbers are not the right ones to cover those four corner number positions obviously! 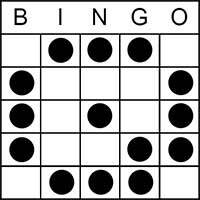 What is a Clock Bingo Pattern? The Clock Bingo Patterns is best described as a large circle patterns on which in the bottom right hand corner of your bingo ticket the hands of the clock can be found, this is a popular bingo game with players as the games can be very fun and entertaining and this Clock Pattern is actually one which is often used on the bingo chat games. When playing such a game if you form the winning pattern first and you claim house via the chat room then you are presented with some form of additional prize, so always be prepared to give the chat bingo games a try as they offer a lot of playing value! What is a Wine Glass Bingo Pattern? 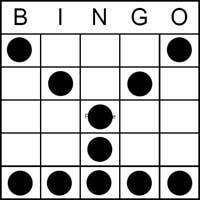 The Wine Glass bingo pattern is a regular bingo pattern and as such it will be attached to several bingo games played in just one bingo room. The pattern resembles a wine glass and in total this pattern is made up of eleven different numbers. Being a regular bingo pattern and one that only requires players to form the pattern in eleven numbers you will find bingo games which use the wine glass pattern are fast playing games so you will not be playing them for very long before someone manages to form the wine glass pattern when playing these games! 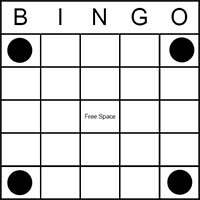 What is a Windmill Bingo Pattern? The Windmill Bingo Patterns is another of the regular bingo patterns, and that means much like the pattern reviewed above it is going to be a regular one that you find attached to a lot of online bingo games and various different bingo sites. The bingo game this pattern is going to be attached to the 75 ball bingo games. In total there are 17 numbers that need to be marked off in a certain way for players to form the Windmill and as much these particular games can take quite a while to play off ad are certainly not fast play games such as the single line 75 ball bingo games are! 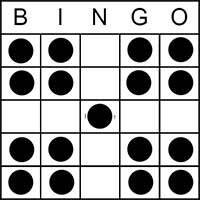 What is a Bell Bingo Pattern? The Bell bingo pattern is one which is commonly found in play at our around Christmas time, however you may find it in use at other times of the year also. In total there are fourteen numbers that you need to mark off each card to form this winning patter so it I not going to take very long until a player manage to form the winning pattern. Be aware this Bell bingo pattern is usually found attached to progressive bingo games so there is the chance to win some huge jackpots when playing for the Bell pattern. What is a Candy Cane Bingo Pattern? The Candy Cane Patterns does of course resemble a candy cane and some people often call this bingo patter a question mark pattern as it does also look like a question mark. You will find this particular bingo patter is used on the progressive bingo games quiet a lot, and as such you could win a hug jackpot payout if you manage to be the very first playing to call bingo when playing or this pattern but you will only be awarded the progressive jackpot if you form that winning pattern in under a pre-determined set of numbers called out or less. 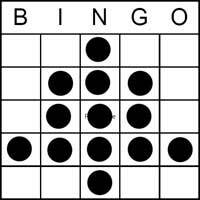 If you call bingo in over the required jackpot amount of numbers called out of the bingo machine then you will only win the standard winning payout and the progressives will roll over and grow in value the next time the progressive game is played. What is a Witches Hat Bingo Pattern? A favourite bingo pattern that is used a lot of times around Halloween is the Witches Hat pattern, this is a pattern which takes a total of thirteen different numbers to form the winning pattern and you will have plenty of fun playing it. 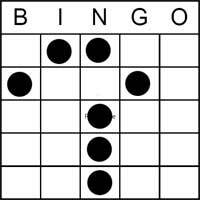 Be aware that this patter is a regular bingo patterns and as such you are not likely to find the games offering it are designed as progressive jackpot paying games. Do look out for this game in the bingo chat rooms as extra prizes will be offered when this pattern is played for in those rooms.